Good old fashioned rivals on what should be a glorious March afternoon at Parramatta Stadium - initially assuming this game isn't flexed to ANZ which it probably will be and thus takes some of the gloss away from putting it in this timeslot - which is just a tad earlier than the traditional 5:30pm slot. With the Dragons also embracing 'big games at big venues' the odds of this being played at Parra, Kogarah or WIN are practically none... still though I'd prefer this to be at Parra or Kogarah, in this timeslot it should still attract at least 25,000+ to ANZ (which yes, I know is more than they'd get at the other two venues but it just won't feel the same) and if the fans are targeted the right way - 40,000 isn't beyond these two fan bases. Good clean family fun at a time the family can actually get to the game... yes please. Just makes complete sense to open with a QLD derby - Cowboys opening up on their preferred Saturday night and Broncos get a big game to start with - albeit on the road. While personally I'm no fan of the Saturday Night game (especially as part of a night where there's two 7:30pm games - ridiculous from a TV standpoint), this is a quality matchup for the timeslot. With QLD an hour behind and the PAR-STI game starting at 5:00pm Sydney time, this game could be brought forward to 6:30pm in Townsville, so it is a 7:30pm kick-off for the main Fox Sports audience. Season opener at Eden Park for the Warriors is a winner on what is hopefully still a warmish Auckland early Autumn afternoon... the Raiders aren't that much of a traditional opponent but it is a matchup that should hold its own against the more 'historic' games across the weekend. Only downside to it is the 4pm local start makes it tough for Canberra fans to travel and then get back to Canberra if they have work the next day. But there isn't another timeslot that maximises the Eden Park factor. 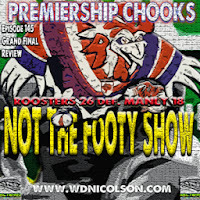 Monster game for Sunday Arvo Footy - LIVE on Channel Nine but starting at 4pm at ANZ Stadium. It needs to be the only game in Sydney because realistically it should crack 40,000 PLUS if marketed right and remember everyone likes their team's chances early in the season. As the only game in Sydney it will fit the bill as the marquee games NRL CEO David Smith is after. And yes, that's 3 marquee games in Sydney in the opening weekend, rather than 4 or 5 average ones. Can't be the case every week but for opening weekend - these 3 are no-brainers. Yes this could have been played at Penrith but really, if this matchup is going to get a decent crowd - it has to be the Titans' season opener on the balmy Gold Coast on a Sunday Night (I'd prefer a 7:15pm start local)... Simply because it'll outdraw Penrith at home to the Titans in Penrith on the same Sunday night. That's just how it is people, nothing anti-Penrith at all but as a drawcard - Sunday night twilight on the Goldy beats no kids being able to go along to Penrith Park because there's school the next day. Not the sexiest matchup of the weekend I'll grant you - but just interesting enough for the Sunday nightcap. These two sides were knocked out in the second week of the finals - at least a week earlier than both thought they'd be entering 2013. Good forward packs going at it on Monday night footy is always in my mind the best mix as somewhat traditionally the weather likes to be ordinary on Monday Nights. Plus both teams will have been waiting those extra couple of days to start their season and throw in the disappointment of the way their 2013 seasons ended and we've got a Monday Night Barnburner kids! So to summarise - Round 1 has 3 games in Sydney (Thu, Sat and Sun - incl. 2 on Channel 9), then a game in Newcastle (Fri - Channel 9), Townsville (Sat), Auckland (Sun), the Gold Coast (Sun) and Melbourne (Mon). If anything should grab you about how we've structured the Round 1 draw it is this: We are a National Rugby League after all - so scheduling 5 of the 8 games out of Sydney to open the season means you maximise the excitement away from Sydney while at the same time creating a need for people to go to the stand-alone marquee games in Sydney - it makes little sense to ski-double up Sydney games in Round 1 as you are simply cutting down your potential crowds. 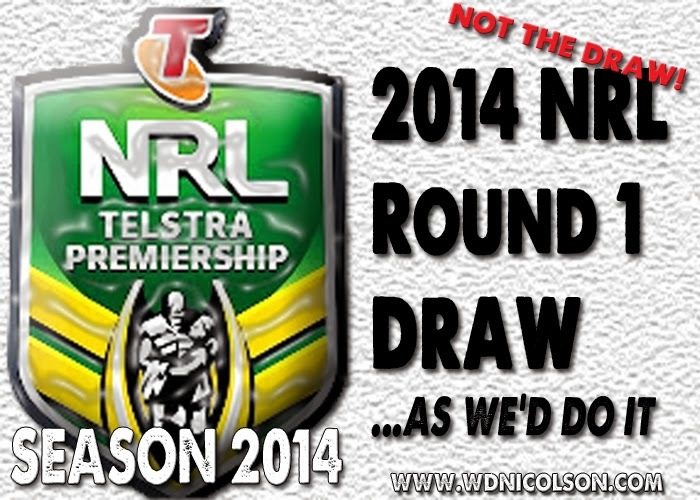 So www.wdnicolson.com's Round 1 Draw features a heavy dose of Common Sense and is truly an NRL Marketer's Dream... care to argue the point? Do you think we've got the mix right for Round 1? Do you agree or disagree with the inherent value of just 3 games in Sydney in Round 1 and 5 more spread around the competition? Let us know what your Round 1 would be by commenting below or replying on Twitter.